Hello friends! We’re back with a second update this month to share some amazing news with you. 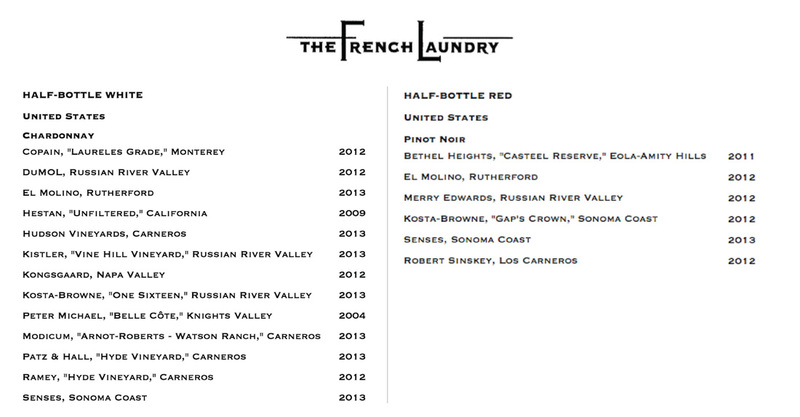 I am very excited to announce that our 2013 Sonoma Coast Pinot Noir and Chardonnay are both proudly featured on the wine list at The French Laundry in Napa (yes, that French Laundry of one of the world’s 50 best restaurants). I’ve literally only dined there in my dreams and never thought that our wines would be featured on their superstar list. When Chris, Max and I got our start in 2011 all we had was my family’s small Pinot Noir vineyard that needed a lot of love and some cheap shears from Home Depot (not to mention some significant student debt). Partnering with restaurants like The French Laundry was the furthest thing from our minds; we were more worried about gophers, rain and harvest. But that’s always been our philosophy: focus on creating a world-class wine first, and the rest will fall into place. Build it and they will come. So, since that first time we walked into that vineyard and said, “well, I guess we’re farmers now,” we’ve kept our heads down and worked ourselves sometimes a little crazy doing just that. To see our efforts over the last few years pay off with such amazing recognition is immensely gratifying and humbling. We really have you, our amazing fans and friends, to thank for this. The French Laundry only works with wines that truly speak for themselves and are beloved by the people who drink them. We couldn’t pour our hearts into these wines without you. So thanks to all of you for your continued support and if you’re planning a very special trip to Napa Valley, then be sure to make a reservation at The French Laundry (or even their sister restaurant, Bouchon) and check out our wines! Just be sure to make that reservation well in advance.